I have put in a few more half days work on the verandah and it is slowly coming to completion. 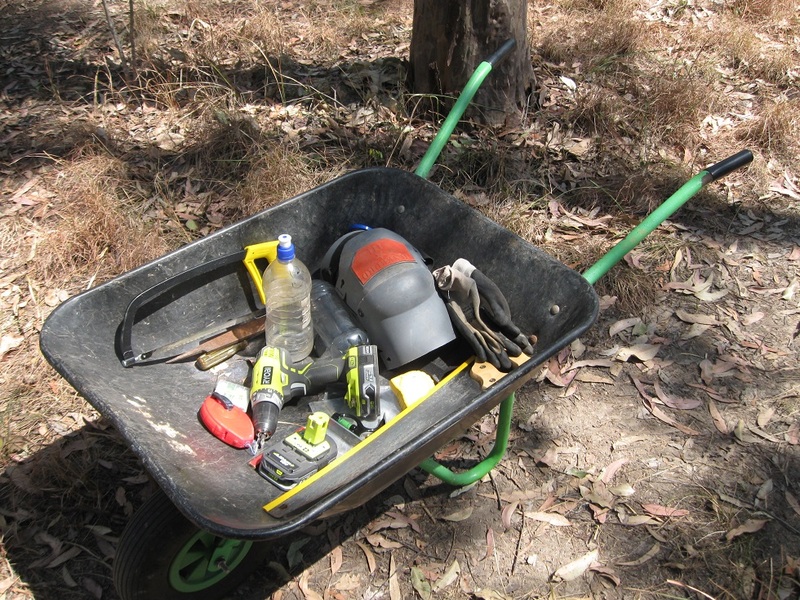 Instead of driving the work 4WD down to the house site, as it currently functions as a very large and easily transportable tool box, I just loaded a few tools into the wheelbarrow and trundled it down. Of course Murphy's Law says you always forget ONE thing every time, and have to walk up the hill again, but that's just extra exercise, and exercise is good for you! I got myself organised for some early morning screwing only to discover that we have no more screws. I looked EVERYWHERE - the 4WD, the shed, the annex, the caravan - and then looked EVERYWHERE again, but no luck. It turns out that yet again the kit home company has not supplied us with sufficient components. 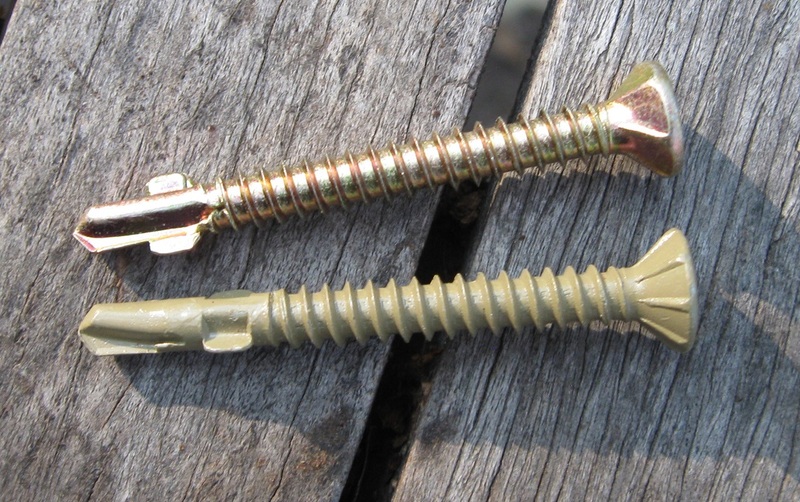 We have some left-over screws from the yellow-tongue flooring which are quite similar but just a little bit different. Unfortunately we can't just 'pop out' to the hardware store to buy more as it is long drive. It is great that we have the option to buy these things over the internet (and often cheaper than a real shop) but we have to know a) exactly what type of screw it is and b) have to wait for delivery. The kit-home company have 'helpfully' told me that I have to go and buy myself some more screws, but have not actually told me the specifications of what I need to buy. 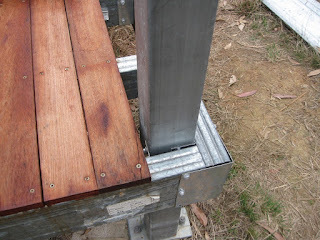 In the meantime I have been cutting planks to length, and cutting out notches to fit around the verandah posts. It is quite the jigsaw puzzle as the last few planks of merbau all have something wrong with them - bent one way, bent the other way, have splits or notches or are too short. I have done my best to figure it out, and then had to figure out the best way to cut out the notches. There has to be one plank with a notch for the inside of the post, and another plank with a notch for the outside of the post. 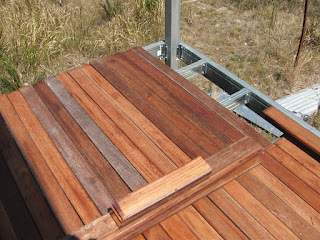 Also most of the planks for the end of the verandah have been cut now, just a few more to go. I popped out to the local hardware store and bought some new blades for the hacksaw, since the ones we had were so horribly blunt they were very painful to use. I am very much looking forward to trying the new blades, which only cost $2.50 each, but it is currently bucketing down with rain so I might not get a chance for a while!